Which type of commercial coffee machine would best suit your business? There are many different varieties of coffee machines available, each with their own advantages and disadvantages, it can be a daunting decision when deciding on what coffee machine is the best fit for your business. But by looking at the individual strengths and weaknesses of each type of machine — espresso machines and bean to cup machines — you can you make an informed decision on which type is best for your unique circumstances or requirements. 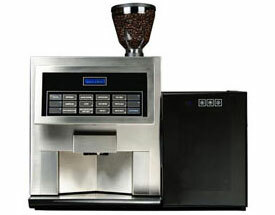 The aim of this section is to help explain the major differences between the two main coffee machines used in a commercial environment: espresso and bean to cup. The espresso is the base of almost all coffees. Short, sharp and highly concentrated, an espresso is produced by passing hot water through the tightly packed ground coffee at a pressure of around 9bar. The resulting drink can be consumed on its own, or blended with hot water, milk and a variety of other ingredients to create Cappuccinos, Americanos, Lattes and a multitude of speciality beverages. Espresso or Bean to Cup? So you have settled upon selling coffee as a core product, but before deciding which specific machine to choose it is time to determine which option is best for your specific scenario. Excellent, providing the barista is well trained. Very good, providing machine is cleaned and maintained. Ease of Use Training is required, but once taught they are very easy to use. Simple: the operator presses a button. Grind the coffee beans and then compress to the required density. Place the handle in machine. Place a cup under the group handle. Push the start button to begin the extraction process. Steam milk in a jug using the steam arm on the machine, and then pour into the cup. The machine does the rest * - the operator can be doing something else. * ie: the machine will grind and compress the beans, brew and pour the espresso, steam the milk and dispense it into a cup. Consistency: Dependent upon the skill of the barista Very - providing machine is cleaned and properly maintained of course. Traditional coffee machines enhance the aesthetics of the establishment and baristas can entertain and talk while preparing drinks, providing a better customer experience. There is no real theatrical value in bean to cup machines due to their functional nature. It is important the Barista controls the coarseness / fineness of the ground coffee, and that the correct amount of pressure is applied when tamping. There is also skill involved in foaming milk correctly. Staff training required for cleaning. A simple backflush procedure and wipe down at the end of every day. Wipe and sterilise steam arms regularly during use. Cappuccino and milk system must be cleaned daily and milk frothers and valves require regular cleaning. A thorough coffee clean is also necessary. For more details, check out our cleaning a bean to cup coffee machine guide. Consistency: Very - providing machine is cleaned and properly maintained of course. Training: Staff training required for cleaning. Cappuccino and milk system must be cleaned daily. Milk frothers and valves need soaking and cleaning regularly. The major difference between the two types of machine is the amount of coffee that each is able to make. 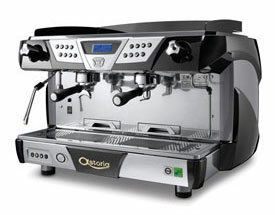 Espresso machines are designed for continuous use and can produce multiple cups of coffee at the same time. A bean to cup coffee machine is limited to a certain number in a day, this is in part due to intricate components that are unable to be in operation for continuous periods. A bean to cup machine has one key benefit over a regular machine - it allows self service usage. This allows you to operate more efficiently, saving staff time and resources involved with the dispensing of hot beverages. The simplicity and push button usage makes the whole process self explanatory and trouble free for your end user. We understand that not every environment is suitable for a bean to cup or a traditional machine and, in some instances, an additional type of equipment or brewing method may also be required. Some machines can even be fitted with coin mechanisms to even take the drink payments at the machine.